The Formentera Council's Office of Youth Services wishes to announce that tomorrow, August 31, will be the last day of the island's summer school programme at the Sant Francesc, Sant Ferran and La Mola primary schools. 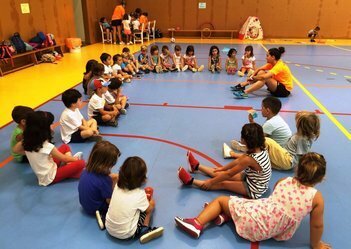 In total, 170 children took part in the July and August initiative—Escola d'Estiu 2017—along with 21 youth workers and one programme director. End-of-summer bashes were being staged today at the three schools, giving parents a chance to visit and see photo slideshows documenting their children's summertime activities. Other activities sought to spice up the final day with things like on-stage performances and dance routines. For the final day of programming tomorrow, all summer school participants will go on an outing to Cavall den Borràs beach. For two months, the summer school's organisers put together activities for kids from 3 to 14 (born between 2003 and 2013). Activities took place Monday to Friday from 9.00am to 2.00pm plus early-start option from 8.00am. The goal, according to the administration's social welfare and youth secretary, was to “create a recreational and educational space for boys and girls in summer”, promoting the “intelligent use of free time and providing options for working families”. The secretary drew a correlation between very high rates of summertime employment and childcare needs. Two sports camps, coordinated by the CiF Office of Sport, were part of an effort to extend summertime options for the island's youngest. One of them, dubbed “Athletics is fun” (Campus d'Atletisme divertit) and home to 42 runners in training ages three to six, also ends tomorrow. That end-of-summer celebration will take the form of a water party at the municipal pool. Guided by four youth workers and one aide, camp participants participated in explorations of motor skills, crafts, swimming, healthy living habits and the plastic arts. The Council organised a synchronised swimming camp too, which was open to children born between 2003 and 2012 and ultimately provided acro sport, motor skills, dance, theatre and swimming activities to 103 children. Those activities, which conclude September 12, have been made possible thanks to the work of eight youth workers and one volunteer. Children in that programme took to the municipal cinema to put on their end-of-summer show last Saturday.